We are pleased to announce the first in a series of free rail related events that Trains In The Valley will be hosting in the Pioneer Valley. Please join us in Springfield on December 13th, 2017 to hear John Bernick, Asst. 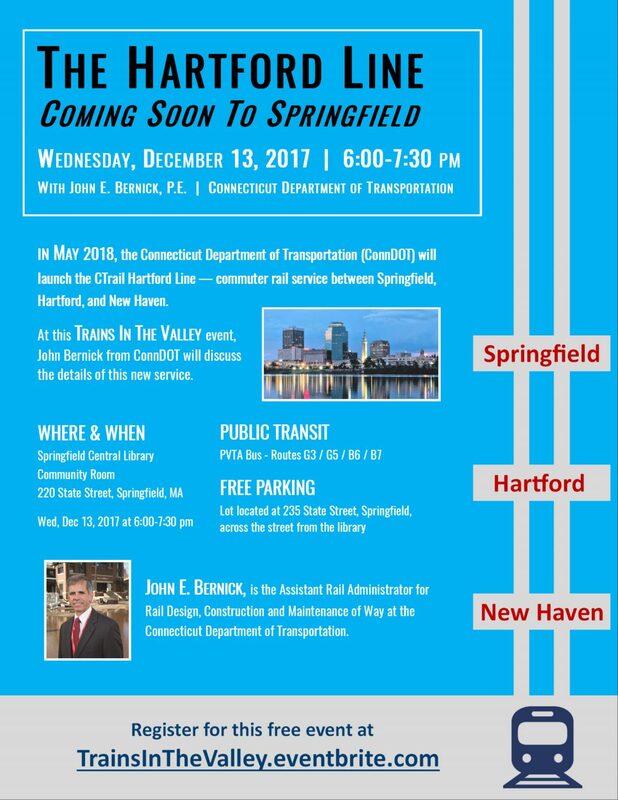 Rail Administrator for the Connecticut Department of Transportation, talk in detail about the new CTrail Hartford line service which will launch in May 2018. On the morning of October 24th, 2017 a hearing was held before the Joint Committee on Transportation in Boston. The agenda for this hearing included discussion related to Bill S.1935, An Act to study the feasibility of high-speed rail access between Springfield and Boston. Attending this hearing was a group of citizens — pictured in the image above — who gave up their day to ride a charter bus from Springfield to Boston to testify in support of expanded rail service between Springfield in Boston. These were people like you and me. People who want to be able to step on a train and travel across our state without dealing with traffic on the Mass Pike. Senator Eric Lesser deserves a great deal of credit for sponsoring the bus that transported these citizens on this chilly October day. But the real credit goes to the people who took the time to take the bus — who took the time to speak up in support of this issue and this cause. For those citizens, we say THANK YOU. Establishing high-speed rail service between Springfield and Boston has significant support across the state, according to a recent survey from the Western New England University Polling Institute. The telephone survey of 468 adults, conducted Oct. 24 through Nov. 7, found that 74 percent supported the idea, while 10 percent were opposed, 15 percent were unsure, and 1 percent declined to answer. The margin of error for the survey is plus or minus 4.5 percentage points. Support was greatest in Western Massachusetts, where 87 percent of survey respondents endorsed the concept, but large majorities in other parts of the state also backed the proposal. Eighty percent of residents surveyed in Central Massachusetts supported the idea, as did 73 percent in Boston and surrounding suburbs, and 68 percent on the North and South Shores. Backing for the idea also crossed party lines, with 80 percent of Democrats and 80 percent of Republicans expressing support, along with 68 percent of unenrolled voters. The sample includes 437 residents who said they are registered to vote, and the margin of error for the sub-sample of registered voters is plus or minus five percentage points. Survey respondents who expressed support for or opposition to high-speed rail had an opportunity to explain why in their own words. 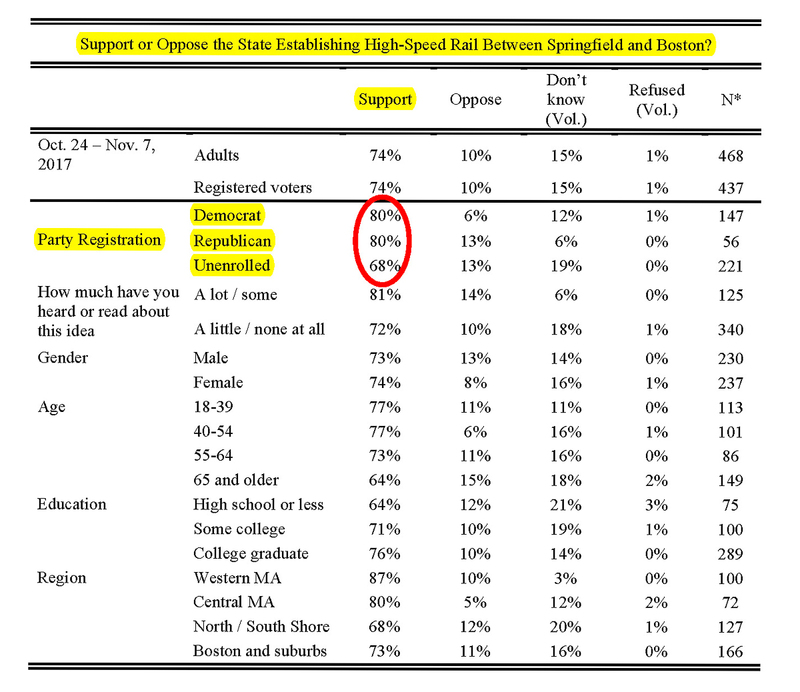 The most common reasons for supporting high-speed rail were the need to reduce traffic on the Massachusetts Turnpike between Springfield and Boston, the environmental benefits of having fewer cars on the road, and improved access to jobs in Boston and affordable housing in Western Massachusetts. Other respondents said that high–speed rail would create a greater sense of parity between Western and Eastern Massachusetts. Will Western Mass Ever Get High-Speed Rail? 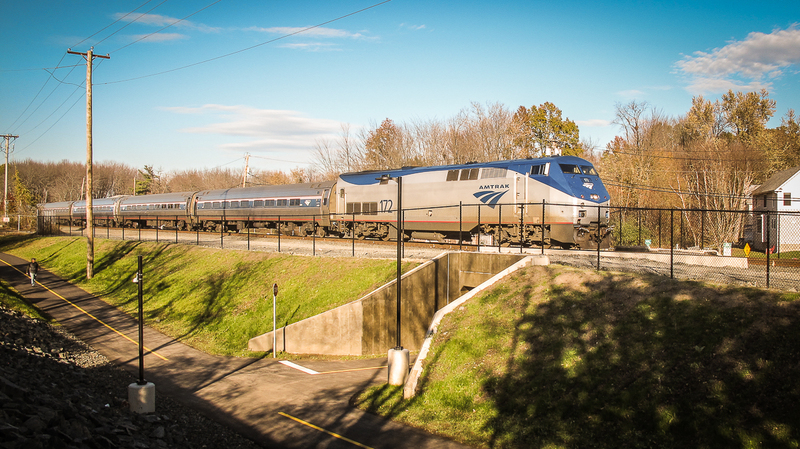 Those interested in the topic of expanded rail service on the Boston – Springfield – New Haven Corridor should read this article by Chris Goudreau. It’s a nice piece, with a lot of great reporting on the topic — including details of Peter Pan’s 3-hour run to Boston, which departs at 5.15 am from Springfield Union Station. 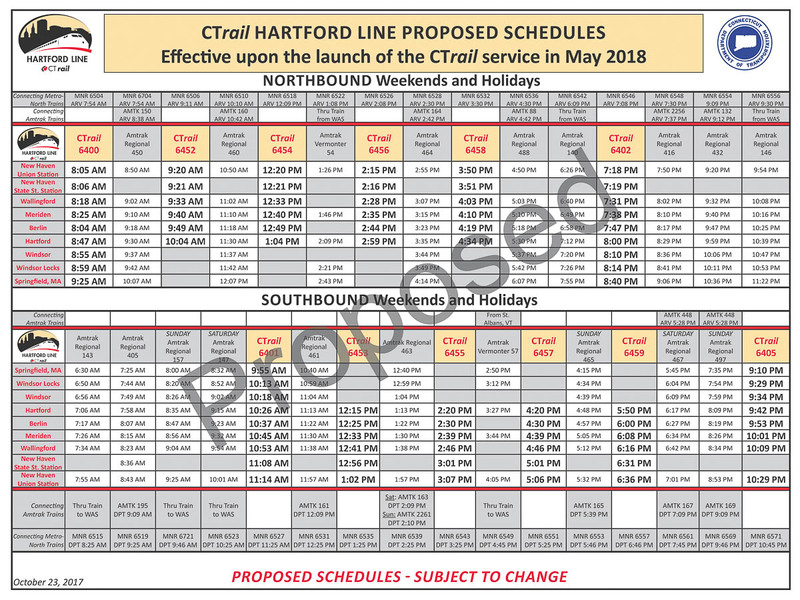 Last week the Connecticut Department of Transportation (CTDOT) released a preliminary set of schedule for the CTrail Hartford Line service. Keep in mind that these schedules are subject to change. The proposed schedules appear very comprehensive, but there is a significant omission. The weekday schedule does not include any service that would allow someone in Connecticut to commute to Springfield and start work between 8 am and 9 am (the normal start time for many businesses.) The only northbound weekday train to Springfield (in the proposed schedule) arrives at 6.20 am which is simply too early for most people. CTDOT hosted Fare Hearings in New Haven, Hartford, and Springfield last week. The hearing in New Haven was the subject of an interesting and detailed news report which is linked below. 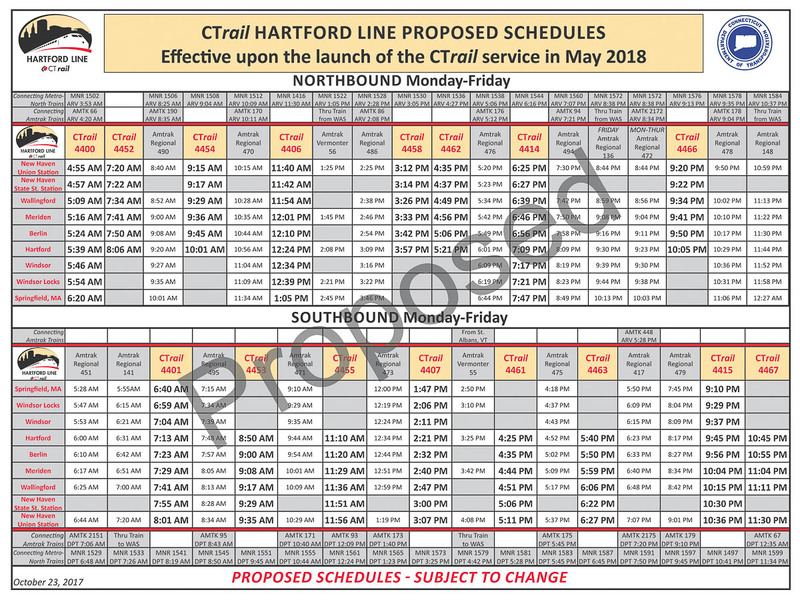 Please note that there is still time to submit comments to CTDOT regarding the proposed fares and service for the Hartford Line. Note that public comments on the proposed fares and service must be received by November 27, 2017. The writer looks at the economic development impacts that are already being felt in towns and cities along the CTrail Hartford line, even before its planned opening in May 2018. It also speaks to a fundamental problem Michael Gallis, a Charlotte, N.C.-based consultant, identified in a 1999 report on how the state can compete in a global economy. Without improved and frequent rail service, the capital region is effectively rendered a transportation cul-de-sac, cut off from New York, the most powerful economic engine in the Northeast, if not the U.S.
That changes with the Hartford Line, something Gallis applauds, though he says high-speed rail would be an even greater game-changer. Please note that the statement in the article about future rail service from Hartford to Boston is not totally correct. The draft State Rail Plan Update for Massachusetts has not yet been released and we would be surprised if the soon-to-be-released draft plan did not outline some sort of path forward for connecting the New Haven–Hartford–Springfield passenger rail corridor to Boston. The long talked about bike/pedestrian underpass in Northampton — under the Connecticut River Main Line — was officially opened November 9, 2017. MassDOT opened the underpass to the public after declaring that the project was substantially complete. Additional images can be found on the link below. The Vermont Department of Tourism & Marketing has published a new 3-page brochure [ Vermont By Rail (PDF) ] to highlight travel to the Green Mountain State. You can find this brochure at the Olver Transit Center in Greenfield and on the platform in Northampton. We are also in the process of distributing copies of the brochure to local Chambers of Commerce in the Pioneer Valley. MassDOT has recently applied for a federal Infrastructure for Rebuilding America (INFRA) grant to upgrade the Massachusetts portion of the New England Central Railroad (NECR) rail line. This project would upgrade more than 31 miles of track and twenty bridge structures on the NECR route. The work in Massachusetts would close a “gap” in the “286k-lb. rail network” that is being built in Vermont and Connecticut. The current industry-standard for heavy axle rail freight cars is 286,000 gross lbs. and these cars cannot be handled on many parts NECR’s rail line in Massachusetts at the moment. Presumably this federal money, if granted, would be used along with the $9 million allocated for this project in the 2018-2022 MassDOT Capital Investment Plan and funds provided by NECR’s parent company Genesee & Wyoming Inc.
Every now and then we come across something really neat that is a little off-topic. This is one of those cases. If you click on the map above you will find your way to a TRAVIC, a Data Visualization Client that provides movement visualization for public transit data. The map shows the movement of trains, trams, buses, subways, and other transit vehicles based on combination of static schedule data and real-time data. The data is sourced from 673 data feeds, 62 of which show real-time information. Zoom in on the Springfield and look at the movement of the PVTA bus fleet. Zoom in to New York City and see what a dense network of subways, buses and commuter trains looks like. Zoom in on Germany and see what a rail network with nearly 15 million departure events a day looks like.